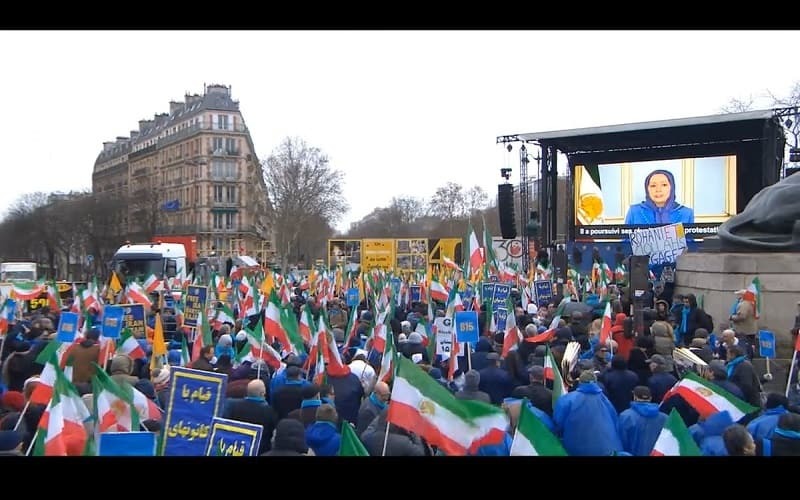 a huge rally was held on Friday, February 19, in protest against the massive violations of the human rights and terror operations directed by the Iranian regime on the European soil at Denfert Square in Paris. of Ashraf Rajavi and Mossa Khiybani high rank members of the PMOI/MEK, in face of Khomeini’s suppression, who kept their promise to restore Iran’s freedom at the price of their lives, in 1981. 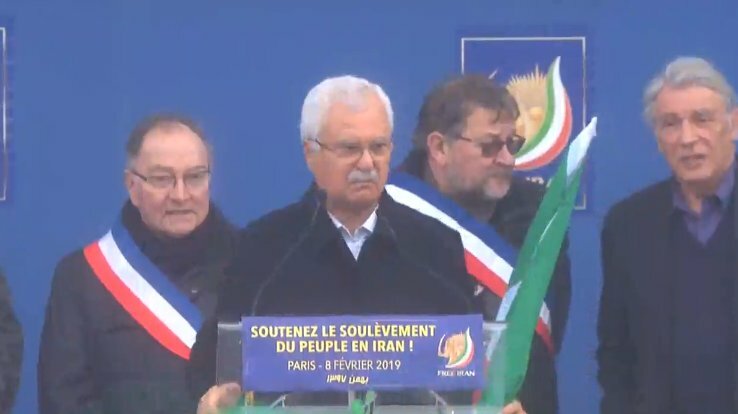 Iranian dissidents, in Free Iran Rally in Paris, condemned the executions and human rights violations at home, as well as regime’s exporting of terrorism and missile program. In that regard, Mrs. Rajavi reminded the arrest of thousands of people last year for protesting against the regime. A number of them were killed under custody and many were tortured. The killings were fraudulently announced as suicides. .
Mrs. Rajavi pointed to the mullahs crack down on Arab, Kurdish, and Balochi compatriots, also, on workers, teachers, students and women, and other sectors of society who have stood up to the regime. 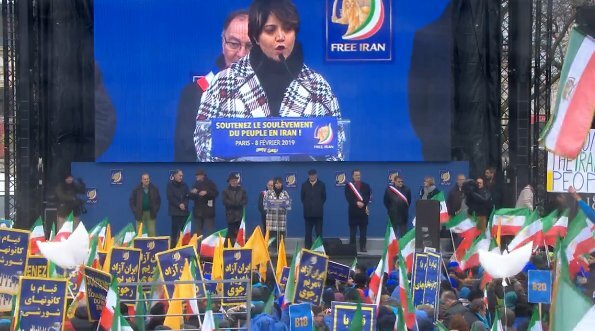 addressing the international community to respect the struggle of the Iranian people and to recognize their goal of liberating Iran and the world from the mullahs’ evil rule. Mrs. Rajavi cautioned the Western governments over their role in protecting the regime especially in the past two decades, via their appeasement policy that gave it many opportunities to survive, by blocking the road to change in Iran through suppressing, blacklisting and constraining the Iranian Resistance. That misguided policy has put the Westerners in crises. These crises could be definitely ended by recognizing the right of the Iranian people’s resistance to topple the mullahs’ theocracy. 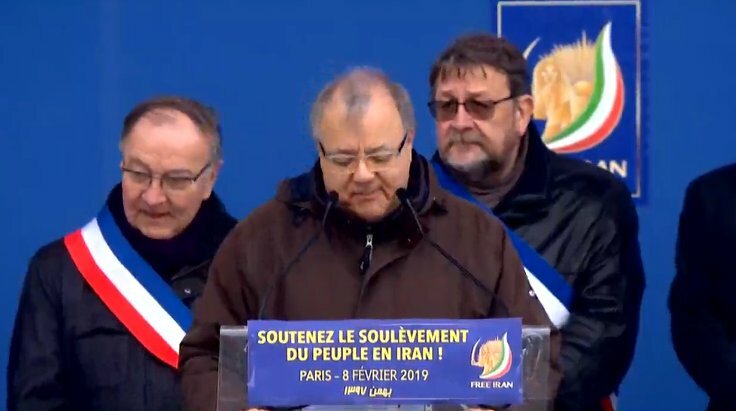 Mrs. Rajavi, in the Free Iran Rally in Paris, called that the heart of the solution to the problem of Iran, the path to Iran’s freedom, regional tranquility, and global peace. 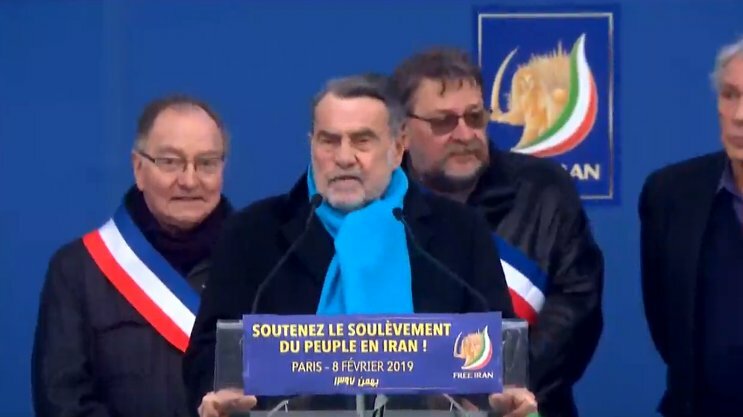 Some of the international political figures, senior former and present officials, mayors and lawmakers who attended Free Iran Rally in Paris expressed their solidarity with the Iranian resistance led by Mrs. Maryam Rajavi and held speeches. 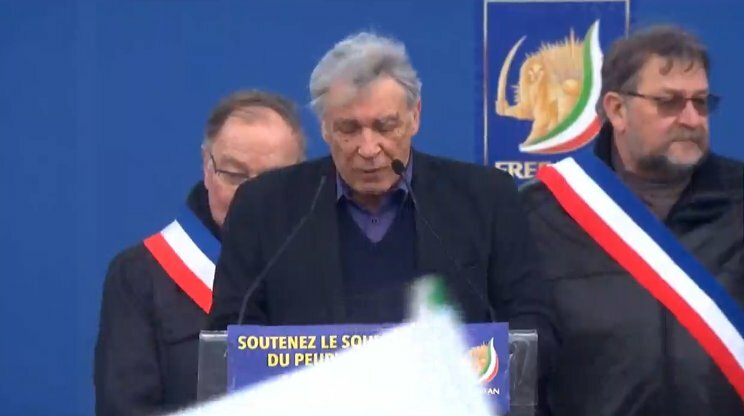 Jean François Legaret, Mayor of Paris-1 arrondissement, addressed the demonstrators in Free Iran Rally in Paris. Mr. Legaret said that the Iranian regime is not legitimate and it tortures its own people on daily basis. He valued the sanctions imposed by the UN for the regime’s record of execution. 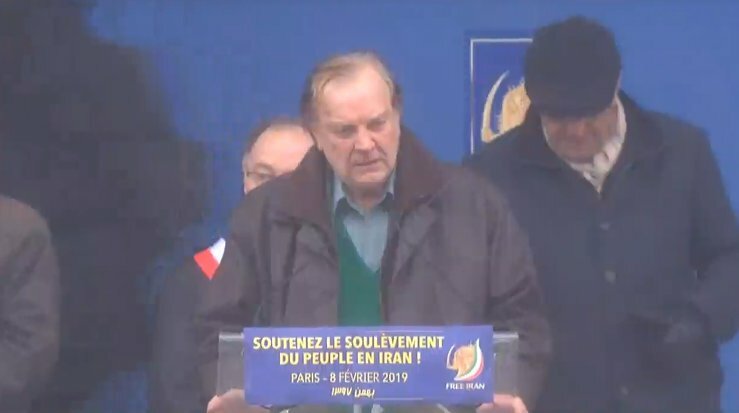 He also condemned the regime’s plot for a terror attack against Iranian opposition’s rally in Paris which was unfolded by the Police in last June. Mr. Legaret concluded that an illegitimate regime has to be overthrown. He pointed out that the Iranian resistance is ready to do so and called for its support. In the end, Mr. Legaret praised the Iranian resistance (NCRI). “Now the whole world knows the danger of this regime and we’ll soon put an end to this regime and the end is near,” Mr. Sabra anticipated. “The Iranian people’s revolution has passed important points. We are at a new juncture and there is a new horizon,” he concluded. 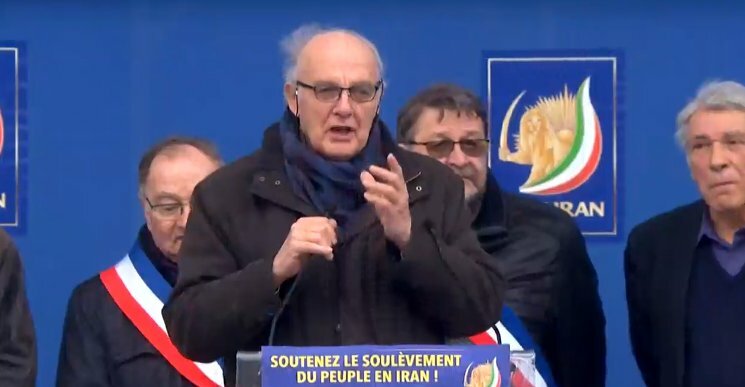 Mr. Jean-Pierre Brad, the prominent French politician addressed the protesters pointing that the mullahs have killed their compatriots in Iran and urged the EU to join the sanctions against Mullahs’ regime. He emphasized that Mrs. Federica Mogherini should not continue relations with Iran, instead she should express her solidarity with the people of Iran. Mr. Ali Bahrami, the representative of Revolutionary Khabat Organization of the Iranian Kurdistan called the Mullahs as the main creator of problems for people of Iran, who have killed thousands of freedom-loving people in Iran and Kurdistan and have executed thousands of prisoners; supporters of the PMOI and other groups. Mr. Bahrami demanded the international community not to appease the mullahs’ regime. He saluted the Iranian people and their resistance. Ms. Azadeh Alemi, human rights activist, was the next speaker. She said, “I praise the Resistance Units for their struggle in Iran and their activities in the course of a national uprising. They recall the memories of young freedom fighters in the 1980s”. 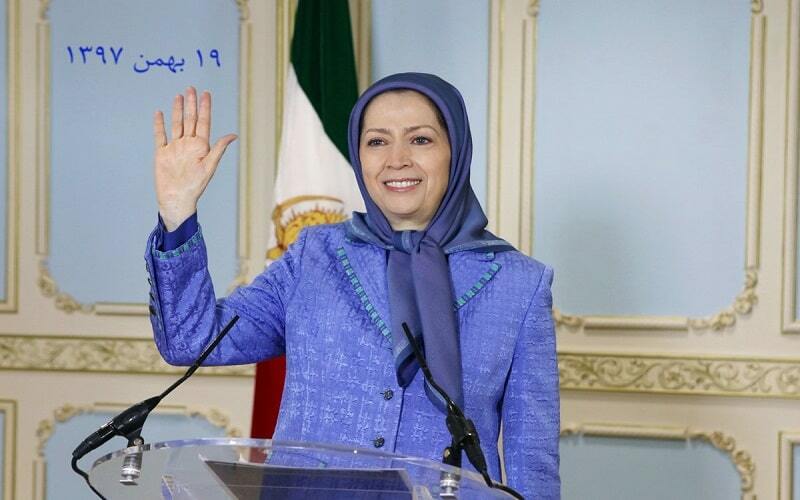 “I would like to salute the Iranian resistance, its leader Mr. Massoud Rajavi and its president Mrs. Maryam Rajavi,” she added. Ms. Alemi supported the 10-point plan of Mrs. Maryam Rajavi, which leads to a free and democratic country. This event is very important, especially before the Polish summit, which is to be set up against the rule of the Iranian religious dictatorship. In my opinion, this was an exponential power of resistance against the mullahs of Tehran.